Cira's Lyrics: Is it a full moon? The last two days the boys have been full of crazy and funny things. I have no idea why, but I'm wondering if there is a full moon I didn't know about. Yesterday I picked up the boys from school and the Big Guy hops in the truck and tells me I need to hurry up so I can 'Follow that silver truck over there!' I turn around and say What?! and he proceeds to tell me one of his kindergarten friends was having a late Halloween party after school (uh huh) and she invited him. She told him to tell me to follow her Mommy's truck home. Ha ha ha ha! Yeah. Um, no. Last night I got tough with the boys and made them clean their rooms. The twins were so proud when they were done. They did their best to put toys away and make their beds. What they said in unison with straight faces. 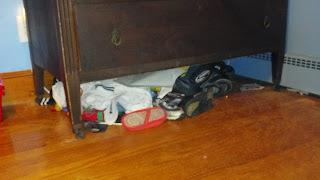 When I asked what THAT was under the bureau they seemed proud to tell me that's where they put 'everything else!' Because of course. The Bunny Bee has been begging me for days to play Cut the Rope on my phone. While Al lets the boys play on his phone, I tend not to. They know what they are doing, but my phone is like my lifeline and I worry there will be an accident. This morning I sat the Bunny Bee down on my bed and reluctantly gave him the phone. And lastly, leaving the house to go to school this morning? 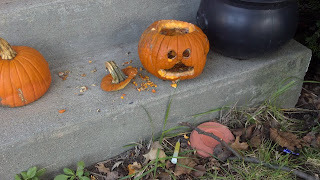 We notice this on the front steps. The boys thought it was hysterical something took off the top and threw out the glow sticks from Halloween. They decided it must have been a 'naughty squirrel'. Where they come up with any of this I have no idea. 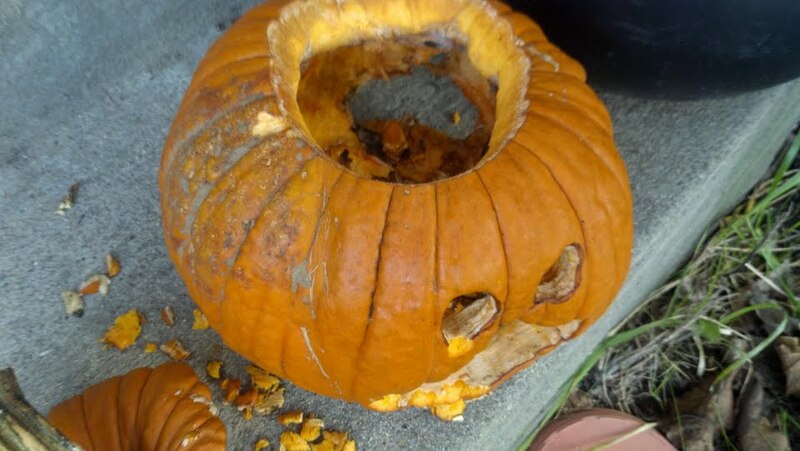 The hole in the side of the pumpkin's head? Not so funny to them. The Big Guy then asked me why he hasn't noticed hands on squirrels.